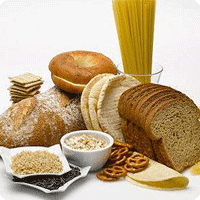 Carbohydrates are one of the substances that are required in the human metabolic system. Carbohydrates include the most abundant organic compound on earth. These compounds have a variety of functions in the human metabolic system performance, mainly as a reserve food as "fuel", and builder materials. In addition, carbohydrates also have a stake in the process of photosynthesis. In the process of photosynthesis, plants convert carbon dioxide into carbohydrates. Carbohydrates are the main energy-forming substances humans in performing all daily activities. Sources of carbs include whole grains and their processed products and tubers. Monosaccharides are the simplest carbohydrates because the molecule consists only of a few atoms C and can not be described by way of hydrolysis into other carbohydrates. Monosaccharides divided into two, namely aldose and ketosa. Examples of aldose called glucose and galactose. While ketosa example is fructose. Disaccharide is a carbohydrate that is formed from two monosaccharide molecules bonded through-OH groups by releasing water molecules. Examples of disaccharides are sucrose, lactose, and maltose. Polysaccharides are carbohydrates composed of many saccharides as a monomer. The general formula is C6 polysaccharides (H10O5) n. Examples of polysaccharides are cellulose, glycogen, and starch. The process of photosynthesis to provide food for almost all life on earth, either directly or indirectly. Organisms autotraof (which can turn into organic inorganic materials), such as green plants, bacteria and algae utilize direct result of photosynthesis. While the majority of heterotrophic organisms (which require organic compounds), including humans really depends on the organism autrotrof to get food. Carbohydrates provide the necessary basic needs of living bodies. For example, glucose (from carbohydrate compounds) which is the main nutrient cells. The body's cells to absorb glucose and retrieve the stored energy to run the body's cells. For humans, carbohydrates are a source of nutrients. In one gram of carbohydrates, there is an energy value equal to 4 calories. Several types of polysaccharides serve as energy reserves. Later, the stored energy will be hydrolysis to provide sugar to the cells when needed. Starch is a polysaccharide deposits in plants. Plants accumulate starch as granules or granules in the plastid organelles, including kroloplas. By synthesizing starch, herbs can pile up excess glucose. Glucose is the main fuel cell, so that the starch is stored energy. Organisms building materials stronger than structural polysaccharides. For example, cellulose is the main component of plant cell walls. Cellulose is like fibers, clay, insoluble in water, and is found mainly in the stalk, stem, branches, and all the woody parts of the plant tissue. Wood is mainly composed of cellulose and other polysaccharides. For example, hemicellulose, and pectin. Meanwhile, the cotton is made almost entirely of cellulose. Carbohydrates prevent the oxidation of fats that are not perfect. If enough energy is not available, will result in increased catabolism of fat. As a result, the accumulation of ketone bodies in the blood and occurs acidity. Energy is the body's primary needs. Therefore, if the carbohydrates that come from insufficient food, protein is converted to produce an amount of energy. In fact, the protein has a primary function as builder substances and tissue repair. In order to be used according to its function, carbohydrate must be met in the daily menu. Carbohydrate is the main nutrient that must exist in a serving of the main meal, for the benefit of carbohydrates as a source of human energy. Eating foods with no carbohydrates cause us to be easily limp, no spirit and activity would quickly attacked panyakit. Rice is one of the most food sources consumed by humans. Especially Austronesian people, food consumption patterns, they are highly dependent on rice or rice. Rice is classified as plant seeds that live in watery land. Grain crops is a type of age only 110 to 115 days from planting seeds. Type of carbohydrate content of rice is amylose and amylopectin. In addition contains a lot of carbohydrates, there are other nutrients that sugar, protein, calcium, minerals and vitamin B. The part that can be consumed in addition to grain inner skin is also better known as bran. Collected when the rice bran penggilangan process. The trick is filtered and separated between the outer skin / damen, bran / rice barn and white rice. Bran is rich in vitamin B complex that are beneficial to human health. In the world there are many types of rice farming that each have their own characteristics and nutritional value are different. For example, grain glutinous rice white color and when ditanak result becomes sticky. Glutinous rice more delicious when made into snacks, or even ground into flour. There was also a red rice Vitamin B complex the sometimes higher than other types of rice. Yam or cassava is a staple food of high carbohydrates derived from types of tubers. Cassava in Latin Manihot esculenta, Euphorbiaceae in the tribe. Cassava leaves can be consumed by humans as a vegetable or also used as fodder. In Indonesia, there are some people who make cassava as a staple food, namely rural Wonogiri and Gunung Kidul. They cultivate cassava as the land in which they live, it is very difficult to grow rice. Rice can not grow well in soil with minimal water. Therefore, mountain residents prefer cassava as staple food source. Moreover, the excess of cassava can grow on barren soil water content slightly. Additionally yam or cassava durable long-term storage. Cassava is preserved called cassava. The content of nutrients in cassava is very diverse including: calories 121 cal, 34.00 grams carbohydrates, 33.00 grams of calcium, and also other phosphor, vitamin B 1, minerals, sugars, and so forth. Even today it is still consumed cassava but has undergone a process of modification of food. Cassava can be a wide variety of foods such as cassava cake, getuk, brownies and more. Potatoes are also included in the staple foods of plant tubers that contain high carbohydrates. According to historical sources, the potato Latin name Solanum tuberosum L. originated from South America. Is the main food Indian society. Potato is cultivated in Europe thanks to Christopher Columbus who brought home a sample of the food crops of the Americas. And eventually become one of the staples of Europeans and Americans. Potato plants can flourish only in the upland farm, the weather was cold only. Soils used must be kept loose in order to maximize the growth of the tuber. Potatoes are seasonal crops, which is short. In the plant there are many bulbs that dihubangkan the root fibers. Potato tubers wrapped in yellow skin while the meat was thin and watery yellow. Nutrient content in the potato is very diverse, which must contain carbohydrates, but the sugar content is very low. It also contains vitamins B1, B2, B3, fiber and calcium. Therefore, people with diabetes are encouraged to change the diet of rice is replaced with boiled potatoes, to control blood sugar levels. Potatoes are also very well taken daily as to diet, lose weight. Another food that is a source of carbohydrate is maize or Zea mays L. This plant is actually derived from the Latin American continent, tepatny from South and Central America. Maize is the staple food of the Aztecs and American Indians. Its history is the same as the potato spread to the world through the medium of sailors. Americans use corn as the primary protein source, while in Indonesia there are also people who make maize as a staple food, which is in Madura and communities on the island of Flores. The content of nutrients and carbohydrates in maize is similar to rice and wheat. So eating a plate of rice corn nutritional value equal to a serving of hot rice. Such reviews about the benefits of carbohydrates and other foods that contain high energy. Hopefully useful.